The Tt eSports Black V2 has a more tried and tested design compared to some other Tt eSports mice. 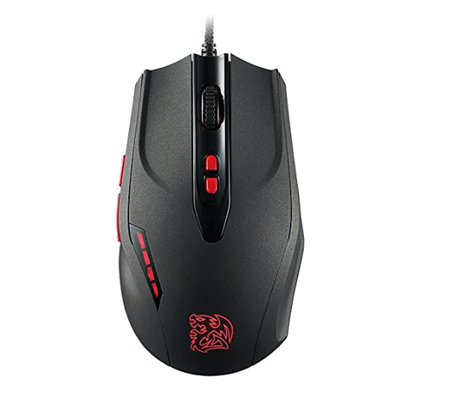 The Tt eSports Black V2 boasts an upgraded Avago laser sensor with omron switches which offers DPI up to 5700, which can be incremented in jumps of 100 meaning there is a lot of customization that can take place. I am very much looking forward to giving the Tt esports Black V2a good gaming test session. I must admit between the laser sensor and the nifty seven button design I was dying to give this beautiful looking mouse a good test out with a long gaming sessions. First let us take a look at the specs. As I said it has a laser sensor which offers up to 5700 DPI which can be incremented by jumps of 100. This means the Tt eSports Black V2 should be able to cater for any sensitive gaming situation. There are seven programmable buttons which through the use of the application included can have 35 programmable macros and five unique profiles. These provide a huge advantage for performing combinations of actions in long gaming sessions, removing strain from the gamer’s fingers which no longer need to press large combinations of keys. Its dimensions and weight are pretty standard as far as gaming mice go with 2.8 by 4.72 by 1.6 inches weighing 10.6 ounces. As an added bonus the red glow illuminates the side buttons, the wheel and the dragon symbol at the base making the Tt eSports Black V2 a nifty touch to any gaming rig setup. 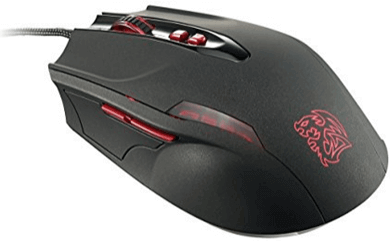 This red illumination is sadly not customizable like many other products which offer illumination such as those of the Razor or Steel Series mice. The Tt eSports Black V2 also has a durable woven cable, unlike most wired mouse which have a plastic cable. This means that the Tt eSports Black V2’s cable has superior longevity and strength even when being used on a vigorous daily gaming schedule. Now for the test! I have the Tt eSports Black V2 a good hard test through the night and I can say without a doubt that I loved every moment of it. 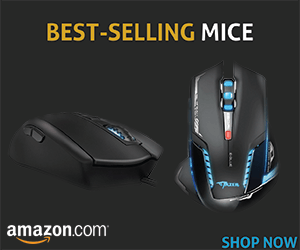 The mouse slid across my desk surface without hassle or lag and provided an excellent gaming experience meeting every situation that I found myself in. This was partially due to the highly customizable DPI settings which meant I could adjust with precision to suit my reflexes, my surface and the gaming scenario – fast paced first-person-shooter or precision real-time-strategy. While I did find the two middle buttons a little large, upraised and sort of in the way of my hand, all seven programmable buttons responded well to my touch and through the use of macros I found that they performed my gaming needs with relative ease. I found that the design and texture of the Tt eSports Black V2 fitted into my hand nicely with a good firm grip and felt durable and strong under my hand. The Tt eSports Black V2 performed well with its optical sensor and precision dpi settings, I found that there was no delay or detrition of performance. The Tt eSports Black V2 worked hard and performed well, at the end of the night I was very happy with the overall performance of the sensor, buttons and glide of the Tt eSports Black V2 and I was victorious in my gaming exploits partially thanks to the Tt eSports Black V2! All in all the Tt eSports Black V2 is a very well-rounded mouse, it has a lot of bang for its buck and performs well under the pressure of serious gaming. 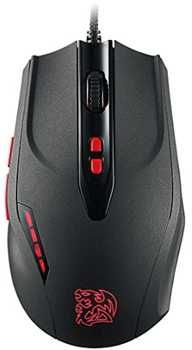 The Tt eSports Black V2 gaming mouse is one that I would gladly recommend to friends looking to up their game with a new middle range gaming mouse. And as icing on the cake, the Tt eSports Black V2 comes with a 2 year warranty so if anything does go wrong, which I doubt, it is under warranty. Stylish looking device for a discerning gamer. Adds style to any rig. Firm grip and durable feel. Might be a little pricy for some budgets. Wired mouse means that cable management is a must. Red is the only illumination option.